Matching Dragoons: Jonah Hex V2 #12 "Bloodstained Snow"
Jonah Hex V2 #12 "Bloodstained Snow"
The Bounty Killers - Three men on horseback ride through a crippling snowstorm into town. The ride up to the general store and encounter the owner, Mr. Dice. He calls them "Mormon scum" and orders them out of town. They respond that their women and children are starving up on the mountain and all they want is food and blankets. Just then five of the most evil looking people walk up the street, explaining that the Mormons have no rights once they stepped into Dice Valley. They introduce themselves as Ringo, Red Crow, Crazy Susan, Earl the Wretch and Doc Grummet. Ringo quickly explains that Dice has hired them to kill the Mormons at $500 a head and $250 or kids. The riders say they have no quarrel and Ringo guns all three of them down (with a double barrel shotgun, meaning that he had time to reload.) Two of the men are dead and the third starts crawling away in the mud. Red Crow catches him and punches him with a barbed wire fist. They hold the man down as the Doc starts practicing his hideous craft. Two Sides to Every Mountain - Jonah Hex and his horse struggle across the mountain in a blinding storm. Finally his horse collapses and Jonah continues on until he stumbles upon the Mormon camp. Jonah collapses himself, unconscious in the snow. The Mormons pull their guns, flip him over and then drag him into a tent. Five Fingers for Five Killers - Jonah awakens to the beautiful face of Anna Wainwright. She informs Hex that the camp had to eat his horse. Jonah says that he would have done the same. Anna asks if Jonah is a soldier (not anymore) and Mr. Dice sent him (never heard of him). Just then the leader of the Mormon, Molokai, storms into the tent, demanding to know Jonah's intentions. Jonah says he was planning on crossing the mountain to find work. Molokai asks if his work is collecting bounties when another member of the camp rushes in, calling out for Molokai. Jonah grabs the man's shotgun and starts demanding some answers. Molokai explains that Dice owns the general store in town and has put a bounty on everyone in the camp. They are Mormons, persecuted, hunted by state governments and non-Mormons alike. Dice refuses to sell supplies to them and when they saw Hex's weapons, they figured he was hired by Dice. The man tells Molokai that Bingham won't last long. Molokai asks about the others, only to be answered with silence. They go to another tent to find Bingham, he teeth pulled and his tongue cut out. Molokai asks how many men are in town and Bingham holds up five fingers and dies. Molokai tells everyone to pack up, they are heading out. Jonah tells them they have another choice and Anna asks if Hex can help them. Dice pours a drink, saying they should discuss it cool and civilized. Just suppose that Jonah IS working for an 'unnamed party', could he be swayed by a sizable financial investment to divulge the location of the camp or even more if Hex were to lead a group of Dice's men up the mountain once the storm passes. Hex turns him down. Dice asks how Hex came to answer their request for aid and Jonah states that he didn't, their request was for him to increase the cemetery population by one, but that doesn't serve Jonah's interests. What does serve his interests? All the blankets Dice has and fifty pounds of beef. Dice smiles and asks if Hex has ever heard of the Mountain Meadow Massacre? A bunch of Mormons attacked a wagon train heading for California, killing everyone in the group. Understanding THAT, then Hex can clearly see that Mormons need to be driven from the land and eradicated if need be. During this time, Ringo and the others come in and disarm Hex and order him to lead them to the Mormon camp. 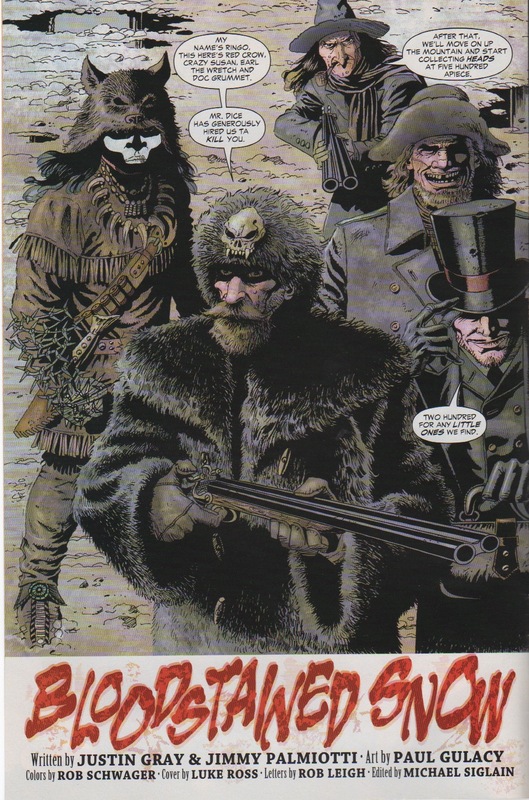 Later Jonah is on horseback riding up the mountain, Ringo, Red Crow, Earl and Crazy Susan right alongside (Doc stayed behind as a body guard for Dice). Suddenly there is gunfire from some overhanging rocks and they realize that they have been ambushed. The Mormon men spring from their cover and take out Earl and Ringo but not before Ringo kills one of theirs. Susan is killed trying to escape. Jonah, unarmed, charges Red Crow, knocking him off his horse. Hex and Red Crow battle in the snow until Jonah plucks a dropped gun from the snow and drops Red Crow. The Mormons step out from their cover. Jonah, the smoking pistol in his hand, says "You used me." Molokai explains that they only took Jonah's advice and made a choice. Hex asks if Molokai was at the Massacre. Molokai says that he was. Anna was one of the children he adopted from that day and says that he was only concerned with the welfare of his people. Jonah argues that Mountain meadows wasn't survival, it was murder to which Molokai asks how many men did Jonah kill in the war? Hex asks what is next. Molokai wants Hex to lead them into town. Gainful Employment - Dice is in his store when the door swings open to the silhouette of Jonah Hex, bloody knife in one hand, small gunny sack in the other. Dice hollers for Doc and grabs his pistol. Jonah throws the knife into Dice's gun arm, grabs him by the hair of his head and smashes his face into the counter. Jonah then tosses the gunny sack onto the counter and Doc's head rolls out. Jonah yanks the knife out of Dice's arm and states that he wants fifty pounds of beef, all the blankets and his guns back. Jonah drags Dice into the back storeroom, asking how much Dice was going to pay Ringo and his bunch. Dice begs for a doctor and says that he was paying five hundred a head but would go up to ten for someone experienced as Jonah. Hex tells Dice he won't let him bleed to death and pulls a paper from his coat as he takes his guns from Dice. Dice starts stammering, wanting to know about his offer to Hex and why Hex is aiming at him. Jonah tells him that the Mormons gave him a large parcel of land if he only take care of Dice. Since Jonah can't be around all the time to check on his investment, he could hire the Mormons to watch over it for him. He also won't let Dice bleed to death and shoots him in the head. Hex rides out of town, the headless corpse of Doc in the street. Timeline - It's unknown how long Jonah was unconscious in the camp, possibly a day or so, enough time for Bingham to make it back from town. The Mountain Meadow Massacre was in 1857, Jonah, at one point states that it was 'years ago' and since Hex was scarred in 1866, this will obviously take place after that. Also, since Anna was a child during the massacre but now she's grown the timeline is holding up here. So this one is 1867 or later. Overall I really enjoyed the story. Jonah gets the short end of the stick, being forced to lead Ringo and the his bunch to the camp and then getting lied to and ambushed by the Mormons, but he comes out on top in his own style. Regarding Ringo and his bunch, well, let me tell ya. When I first saw them on that splash page I thought YAY, the Injustice Society of the 1800's, but as things went on, I liked what Justin and Jimmy did with this. They didn't give us an origin or explanation of each character. Their names and actions were enough. Normally when we meet a "band' of outlaws, at least in superhero books, we have to go through long exposition about their powers and what not. Not here, you just get their names and you hang on to learn from their actions. I enjoyed that a lot. Justin and Jimmy also did this in their Uncle Sam and the Freedom Fighters books. Nice touch. The art? 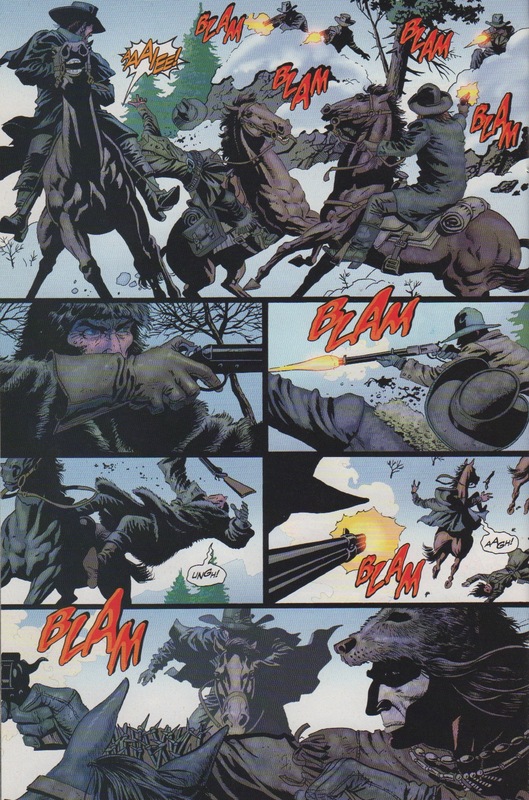 well, I'm not a fan of Gulacy. The panel borders are black and if the panels themselves are mostly dark, it can cause comprehension problems for me (but I'm old and stuff like that). His stuff is gritty enough but at times his faces were hard to keep straight. I identified people more by their environment and clothing than by their face. Also, Jonah's facial wound kept changing texture. Huh? The cover by Ross was beautiful, but sadly, it's a bad cover. I don't think it draws the reader in to the story and looking at it amongst a stack of books, I couldn't tell you what story inside could possibly contain. 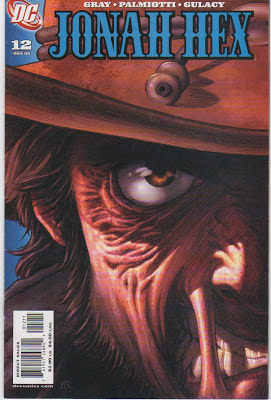 Next Issue - The Origin of Jonah Hex!! !